PenJob.org Reviews – Legit or Scam? PenJob.org is a website that promises to give people the ability to earn up to $250.00 per day performing freelance writing assignments of their own choosing and on their own schedule, as they see fit. Freelance writing jobs are one of the most popular and well known ways for people to earn money from the comfort of their own homes. Many different people and businesses have a need for various writing projects that they may not have in house staff to complete. MyWritingJob.com Reviews – Legit or Scam? MyWritingJob.com is a database of freelance writing jobs which claims that anyone can become a freelance writer by completing their training today and earning their first paycheck in 30 minutes. This company is not hiring employees; rather they simply give you access to companies or people that are looking for freelance writers to complete specific projects. They say the only requirement to complete these jobs is to be able to read and write English fluently. In order to sign up for MyWritingJob.com, you simply need to give them your name and email address and pay the $34 subscription fee, which is a 50% discount off the standard $68 fee. Real Writing Jobs Reviews – Legit or Scam? 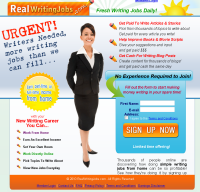 RealWritingJobs.com is a website that’s designed to help people find a variety of writing jobs; they claim to have a ton of leads and are simply acting as middleman between writers and contractors. These types of sites have been around before and usually provide mixed results. These sites work by using software which visits a collection of job search sites, freelance websites, and other areas online where work for writers gets posted. They then return these results in your members’ area. In most cases these are real writing jobs and are usually put out by website and blog owners who want cheap labor to fill their sites full of content.